My name is Bishnu Maya Subedi. I am 21 years old. I am Nepali. The name of my village is Kaskikot. 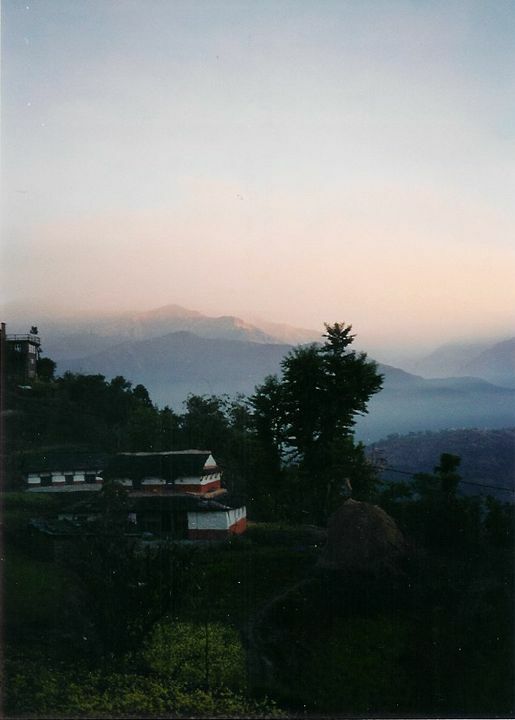 It is in the foothills of the Himalayan Mountains, and the air is wonderful here. 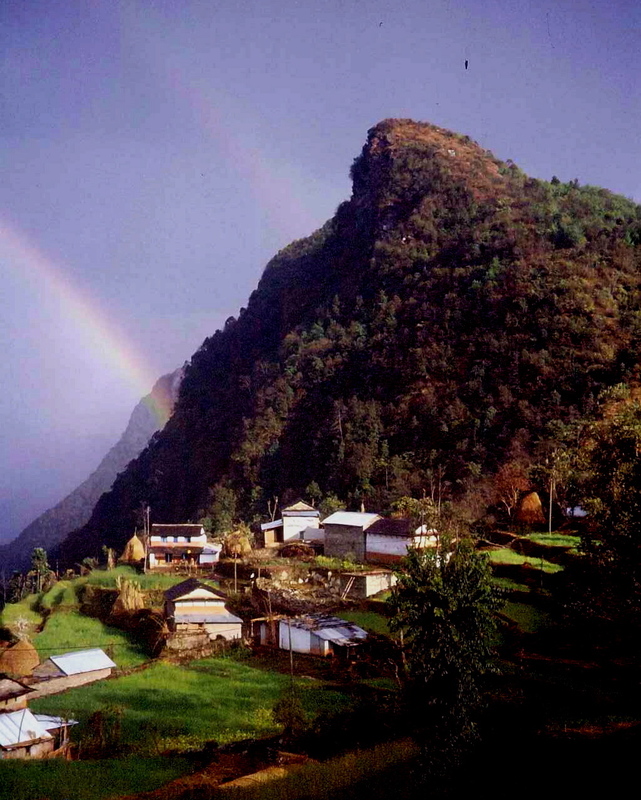 Kaskikot is a small place, and my country is poor and underdeveloped. 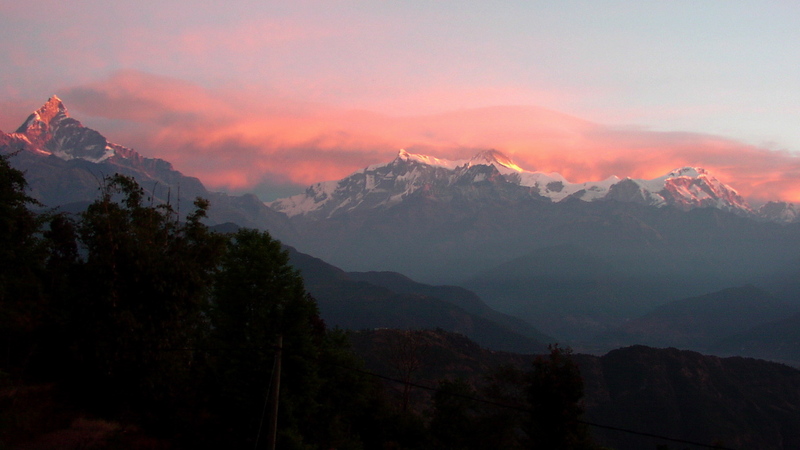 But to the north of my home we can see a whole range of beautiful peaks: Machhepuchhre, Annapurna, Dhaulagiri, Hiunchuli. And to the south, a fantastic view of Pokhara city and Pewa Lake. Kaskikot is named for the Kalika Temple, which sits in the forest at the top of a steep, high hill very close to our house. The Kalika Temple is an important cultural and historical landmark, and it’s my favorite thing about this place. From there the view of the mountains to the north, and Pokhara and Pewa Lake to the South, is soothing and peaceful. In March and April, the woods are full of Nepal’s national flower, rhododendron. During the summer, there is cool air to breathe there, and peace in the full natural beauty. I think this place has all the pieces of Heaven. My house is a traditional village home. It faces south, and the walls are painted red and white. We’ve painted all different colors on the windows and the front door, too. Our house is so small that, from a little ways off, it looks as if you could pick it up and take it with you. Our house is made of stone, mud, wood, and tin. The main part of the roof is made of stones, and two smaller roofs off to the side, which cover the kitchen and storage room, are made of tin. All together, there are just four rooms in my house. One is for sleeping; that’s the main room, the one you enter when you first walk in. A few calendars and colorful pictures are hanging on the walls, and there’s a gas stove that we got just last year. This main room has two beds: Aamaa sleeps on one cot, and Didi and I sleep on the other. “Didi” means “older sister,” by the way; I have one didi, and her name is Malika. To the left of the main room is the kitchen, where we cook over a fire, and keep all our pots and such. To the right is another very small room, accessible only from the outside. Our two goats and the chicken live there. Then there’s the attic on the second floor. We use it for storage. We have two buffalo, two goats, one chicken and a cat. On the other side of our yard is the stone barn where the buffalo stay. There are five people in my family: Malika, my didi, her husband Prem, who I call Binaju, Aamaa, Laura, and me. My father was struck by lightening in our field when I was an infant, so our family was only women until Didi got married. This days, there are just three of us in the house: Aamaa, Laura and me. Didi and Binaju are living in a room in Pokhara, because Binaju is looking for work as a trekking guide. Didi takes care of household chores in the rented room where they live. She’s also pregnant. And my mother’s health hasn’t been very good recently, so I’m doing most of the fieldwork now. It’s October, and we are about to harvest our rice. The truth is that I have been troubled with worry since the day of my birth. When I was just five months old, my dad died, and as a child I never knew the love of a father. In many ways I was orphaned from the time I was a baby. Eventually I was old enough to understand that my father had been struck by lightening, and the mental effect of this knowledge grew slowly in me over time. Because to this day I still don’t know what my father’s face looked like; how much love I might have found there, or how my life might have been. Even now, if I could hold a single photograph, or meet him in a dream, it might bring peace to my own face. It’s just me, and my sister, and my mother—no father, and no brothers. Because Nepal is a completely male dominated society, this has made our lives very difficult on a daily basis. People have always sought to take advantage of us. With an older brother my life would have been very different. But what can I do? It’s only to society’s powerful that God writes the future kindly. Even if my heart is littered with troubles, God has written that I should bear this fate. So in the face of all these obstacles, we began school. My mother faced great challenges in teaching us, and my sister and I have traveled an extremely difficult road in trying to complete our studies. I’ve studied through 12th grade. My primary school was only five minutes from my house, just a small building with seven rooms. It was there that I began my life as a student. We learned to read Nepali, and our ABCs, simple words and stories, letter-writing, and math. We studied the environment. After that, secondary school was a fun time for me: being with friends, studying, and playing. After I passed my national high school exams, we borrowed 20,000 rupees from my uncle so that Didi and I could continue to study in grades 11 and 12 in college. Our college classes were from 6 to 10 am, an hour walk away. During that time, my mother was sick; one night, out of the blue, she began throwing up blood. It lasted through an entire terrible night, and we had to call a taxi in the morning to take her to the hospital. There was no bus here during those years. Aamaa stayed in the hospital for nine days, but they couldn’t find anything wrong with her, and we came home. For a while she was too weak to even cook for us. So during our 11th and 12th grade classes, starting when I was 16, Didi and I were really busy around our house and in the fields. Household work here is a full time physical activity, and it was extremely difficult for me. I was really tired during those years, and it was just about impossible for me to study. I loved being a student. I loved the smell of new books, and talking and studying. I loved learning new things—I still do. My favorite subject was health. Growing up, I wanted to be an important person, a social or health worker. I still do. These days, Nepali children learn to say “Hello, Namaste” to foreigners in the road before they learn the words “mommy” and “daddy.” But because I live in a small part of the village away from the main road, I never talked to tourists that came through Kaskikot. And I didn’t respond to their greetings either. My school friends and I used to laugh when foreigners would say “Namaste” because it sounded like “Na basne,” which means “Don’t sit down.” I had no idea how to talk with foreigners, and I had no desire to, either. When I was 16, at the same time I started my campus studies, and I started volunteering at the family planning clinic in Kaskikot. There was a Japanese volunteer there named Mayu Takeuchi. She became my first foreign friend. Because she spoke excellent Nepali, I was able to talk with her as I do with my Nepali friends. We talked about our families and personal lives. This was my first experience really interacting with foreigners, and I felt proud of myself. Sometimes Mayu would visit our house, or spend the night. And she also introduced me to two other volunteers, one Japanese and one Korean. There was also a Korean man who worked at the tourist hotel near our house, named Mr. Singsong. But he didn’t’ speak Nepali or English, and I can’t speak Korean, so we couldn’t really discuss much of anything. And about what two years later, another volunteer came from Japan to work at the family planning clinic. Maki became a dear friend. Maki was still here last year, when an American volunteer named Laura became a member of our family for two months. Until then, I’d always lacked confidence with foreigners. But she was like another sister in my home. After Laura came to stay for the first time, I was introduced to many other foreigners. Dan, Debbie, Emily, Paul, Dave, Ash, Maria, Melinda, Leon, Rob…. This is the age of computers. Through them we can see the entire world, and learn about any place in it. But it wasn’t until about two or three years ago that I learned the Nepali world for “computer” from a book. It’s shushakhya yantra, which means it does computation, like math. When Laura moved in with us, I went with her to Lakeside, the tourist area in Pokahara, where she checked her email. I didn’t know what she was doing, so I was bored. But eventually I created my own email address, and began using a computer myself. My small family has found itself faced over and over with hospital and education bills. And then there’s the household expenses: electricity, food. I’ve applied for many different jobs, but with no luck so far. I am constantly plagued with worry that I have no source of income. Didi was married a year ago, and during the wedding, part of me was cautiously happy at the idea that her husband would be an older brother to me. But Didi and I have always been together, and the other part of me knew that she’d be going to Binaju’s house and that I would be left alone to face the world. I might get married, but I don’t have any marriage plans at the moment. First I want to study, and find a good job, and make something of myself. That’s what I’m working on right now. 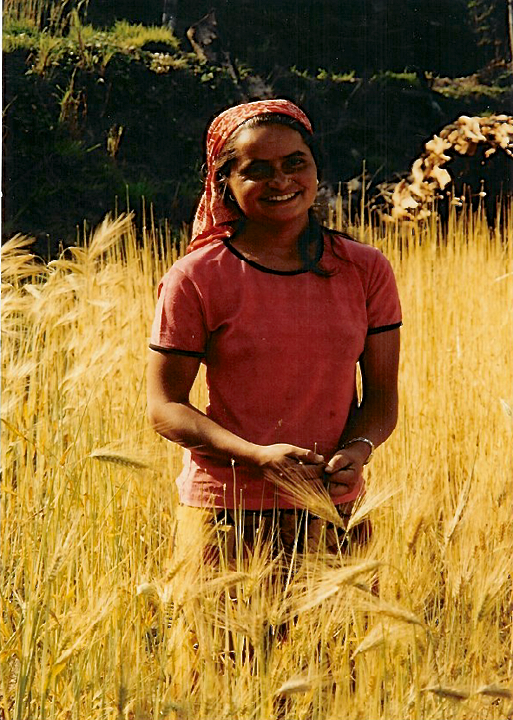 From August 2003 – May 2004, during the nine months I was living in her house, Bishnu began keeping a journal in English. I also gave her a list of questions about her life, and over the spring, helped translate the answers she wrote. This is an edited version of Bishnu’s writing from that year. Extraordinary indeed! Thanks for saying hello!